It happens multiple times each week. A patient arrives for a consultation, bringing outside medical records from the emergency department where his or her initial evaluation took place. Inevitably I will find the above statement, or some slight variation of it, stated in the notes, as if serving as a justification for why it was okay to send the patient home. Often the patient wonders why he developed partial visual loss for 30 minutes, or why the left side of her body was tingling for hours even prior to the decision to seek medical attention. After all, the symptoms seemed real at the time, but how to explain what happened since the head CT ruled out a stroke? There are, of course, significant concerns about a young stroke patient seeking medical attention in the ER with stroke-like symptoms, and then being discharged home. The most critical reason to identify early ischemic stroke symptoms in a patient of any age is to take advantage of the only FDA-approved medication in the treatment of acute ischemic stroke – IV t-PA. As mentioned in a previous post, t-PA is a “clot-busting” medication. When a clot blocks blood from flowing in an artery, the administration of t-PA can dissolve the clot, relieving the obstruction and allowing blood to start flowing again. In acute stroke, every minute that passes equates to the death of approximately 1.5 to 2 million neurons (cells in the brain or spinal cord). With each passing minute that blood is not flowing to part of the brain, the likelihood of a good functional recovery decreases. In addition to the decreasing benefit of t-PA with the passage of time during those first hours of an ischemic stroke, the risk of cerebral hemorrhage from giving t-PA increases. As tissue in the brain sustains injury from this lack of blood flow, the tissue becomes “leaky” and starts swelling, and giving a clot-busting medication like t-PA to a patient with brain tissue that has already died raises the risk that the drug could cause a brain hemorrhage. This graph appeared in the paper that outlined the results of a stroke clinical trial known as the ECASS 3 study. ECASS 3 was a trial that demonstrated that some patients benefitted in terms of functional recovery from receiving t-PA out to four and a half hours after the start of their stroke symptoms. Prior to this trial, the “window” for giving t-PA to an ischemic stroke patient was three hours after stroke symptoms began. The FDA in the United States has not approved t-PA for use beyond three hours into an ischemic stroke, although in other parts of the world t-PA has been approved for up to 4.5 hours based on this data. I include the graph from that paper to demonstrate that minutes do count. The higher the solid line is on the graph, the better the likelihood of a good functional outcome without significant disability after a stroke. As time passes on the x-axis (numbers on the x-axis represent the number of minutes that have passed since a stroke began), one can see the line trending down, indicating smaller chances of seeing a good outcome. Once the line crosses at 1.0, this is the time point at which is becomes more dangerous to give t-PA because the risk of bleeding is no longer outweighed by the benefit. At this point, for the majority of patients, brain tissue has died, and there is no more benefit to be gained. When the assumption is made that a patient with stroke-like symptoms is not having a stroke, a CT scan of the head is usually obtained to confirm this assumption. This is flawed reasoning though. The sensitivity of a CT scan without contrast within the first 12-24 hours of an ischemic stroke is around 65%. This means that 35% of patients presenting 12-24 hours after a stroke has started will have essentially normal head CT scans. 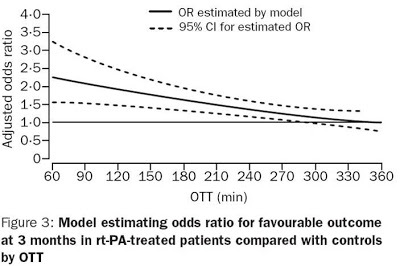 Now, consider patients who are within the time window for consideration for t-PA. The sensitivity of a head CT scan during the first three to four and a half hours of a stroke is even lower. A head CT scan is a very good tool for diagnosing bleeding that occurs in the brain, and this is the reason why patients presenting with stroke symptoms are supposed to have a CT scan – to look for blood. The purpose of a CT scan should not be to diagnose an ischemic stroke. The likelihood of detecting hemorrhage in the brain is around 90-95% with a CT scan. Since 20% of strokes are of the hemorrhagic type, but it is impossible to determine based on a patient’s symptoms alone whether a stroke is ischemic (due to a blood clot blocking blood flow) or hemorrhagic, a CT scan clarifies the stroke type. When I am seeing an acute stroke patient in the ER, I expect to see one of three things on the head CT: 1) evidence of bleeding (hemorrhagic stroke), 2) evidence of ischemic stroke (which means swelling and cell death has already occurred), or 3) a normal head CT scan. It is the patient with the normal head CT scan who should receive t-PA, because this is the patient who is very early into an ischemic stroke. An early stroke can be a treatable stroke, but if a patient is sent home on the assumption that a normal CT scan “ruled out” a stroke, then the only evidence-supported medical therapy for treatment has been denied to that person. Why don’t we attach tPA to magnetic nanoparticles and direct that to the clot? The size of the bolus could be considerably reduced. Will the Xprize tricorder solve the issue of knowing whether or not a stroke is occurring without massive infrastructure and neurologist knowledge? This is exactly what happened to my 10 year old daughter after a first, mild stroke caused by a dissection. She then went on to have a massive stroke with devastating consequences. So sad. There needs to be much, much more medical education about this. Who writes the neuro textbooks for students? Has anyone looked at the Brainomix Ltd, Stroke imaging software called e-ASPECTS? The software automates the Alberta scoring system for areas of ischemia in and around the brain it is being developed by an Oxford University start up company …if you wanted to see how it works go to their web site and give it a try with their UI model. I was really impressed by it. This is completely true. I was 44 when I suffered two strokes caused by ICAD and they did not show up on the CT scan. I kept telling doctors that I felt like I had a stroke because of the numbness from my fingers to my face but they didn’t believe me because I didn’t look like I had a stroke. They were identified by an MRI days later. They thought I had soft tissue damage as a result of a headlock gone wrong. When the Ortho read the scans he said I had some rutured discs and recommended physical therapy. Ha! Imagine if I’d listened to him? He ignored my sagging left eye and other symptoms. Fortunately my paramedic son saw my eye and insisted I go to the ER as he was sure I had a neurological problem. Yes, my 22 yr old son saw what the Workers Comp Doctor didn’t. 24 hours later after 8 hours of diagnostic tests and an ambukance ride to a trauma center, I was given the first of three cerebral angiograms for my 100% occluded left ICAD. During the diagnostic testing nurses and doctors continued to approach me and ask if they could examine me because they’d never heard of an ICAD or Horner’s Syndrome. My point? Medical schools need to educate all doctors on the signs of a CAD. Also, as many other of my fellow ICAD Misfits will tell you, many doctors dismiss our complaints or symptoms as though we are being dramatic because the doctors do not have enough knowledge. Even the most highly trained neurologists have difficulty understanding the symptoms. I’ve been insulted a few times by the attitudes of a doctor or two who refuse to accept that there could be something about nerve damage that they don’t understand. And in my case because I was dealing with Workers Comp I had to overcome the usual adversarial relationships that this inept system fosters. That made my condition worse. I think that we sufferers of ICAD are the best source of information on the injury, disease, whatever you call it. I know my body and my body does not necessarily react the way the medical books say it should. I have had to learn and adapt on my own to a large degree. The limitations I have 4 years later are just the new me. I’ve tried to push beyond these limitations , like the good athlete that I was. But when I do I pay for it dearly. So my advice to all is to take it slow and learn how far you can go and don’t push yourself too much. It seems strange that most of us were athletic people. I wonder why as athletes we suffer these CADs? In my case it was trauma. But when it’s not trauma and a person is athletic, is it the exertion of exercise? Could TPA be given by mistake to a patient that shows ischemic stroke symptoms but actually has an internal carotid ,ICAD, artery dissection that is missed on the conventional CT scan question ?